This was the first film I saw as part of my new AMC A-List subscription (more on that in a future post after I have spent some time with it), and The Upside is pretty much what I was expecting. It is a run-of-the-mill dramedy (more parts comedy) featuring big-name stars Kevin Hart and Bryan Cranston. It checked off a lot of common based-on-a-true-story cliches, had well-defined but mostly foreseeable character arcs, and slightly contrived moments of emotion. A quick skim of other critics’ reviews seem to all come to a similar consensus, but trending more negative. The Rotten Tomatoes summary says the film is “frustratingly cliched” and Mark Kennedy of the Associated Press said “few films in memory have squandered so much acting talent in such a cliche-ridden… way”. My take? Yeah, it has its problems. 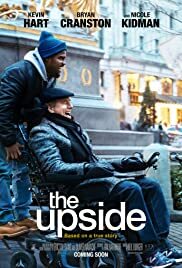 The Upside is not winning any awards or trying anything remotely new or original. It is full of cliches but I do not find it “frustrating” or that it “squanders” the talents of Hart and Cranston. Sure, it does not really soar in a way it possibly could have, but The Upside is still a decent film, a good, average, film that is easy to turn on and watch when you cannot really decide something. Not worth a viewing in the theater — unless it is “free” with something like A-List — but do not shy away when it hits streaming services.